Also available as an ebook in Kindle and ePub formats. Thirty Secret Years reveals how an enterprising Scottish linguist was able to decipher German naval messages in the Admiralty in World War One. 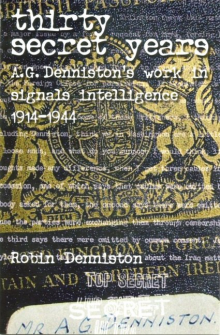 Alastair Denniston became head of the British government’s cabinet noir or cipher-breaking bureau in 1919, developed his team of fellow experts between the wars by spying on the Soviets from Whitehall. In 1939 he went on to lead an enlarged body of secret service men and women to Bletchley Park where they solved the vast problems of machine encipherment, enabling Churchill to avoid defeat in 1941 and invade western Europe in June 1944. It is the story of how one man, working in obscurity and total secrecy, influenced the course of world history over 30 years of war and peace, told by his son.